Vtech KidiZoom Plus Digital Kids Camera – Review & Giveaway! My kids are always trying to get their hands on my cameras. Always. Of course my cameras aren’t the cheapest cameras by any means and they certainly aren’t drop proof. They aren’t easy to use and don’t have any fun options that kids would enjoy. More and more I was looking for my camera and realizing the reason it wasn’t where I left it was because someone had snatched it on me. That someone being my three year old. I knew it would only be a matter of time until he dropped it or did something to my camera unintentionally and since he had such an interest in taking pictures I didn’t just want to forbid him either. I started looking into child safe and child friendly. Of course one of the first brands I checked into was Vtech! Vtech has always provided my family with great educational toys! Toys that are durable and last forever. 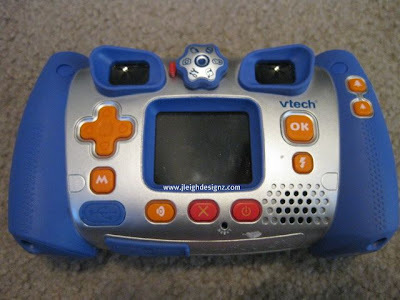 I have never had to toss a vtech toy, they normally get handed down through our family from child to child! They are priced great making them affordable too! 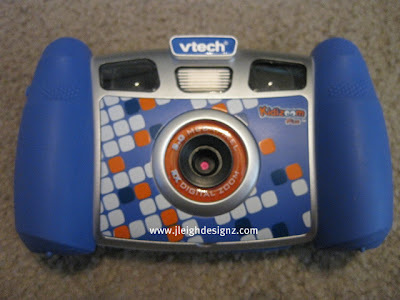 The Vtech KidiZoom Plus is a great camera! Its not too big that its bulky, but its not so small that it fumbles in their hands. The sides of the camera acts as handles making it really easy for smaller children to hang onto without dropping it. Since the sides are also over sized and has a rubbery texture it prevents it from getting damaged in the event your child does drop it. Another great feature is that this KidiZoom Plus has 2 peep holes as well as a working LCD screen. Since little ones struggle with the whole one eye thing this makes it super easy for them to point and shoot. My 9 year old son likes that he can just use the LCD screen instead of the peep holes. Since both my children are sharing this camera I love that it has 256 MB so that it can hold over 2000 photos right on the camera. You can also record a movie for up to 10 minutes. If for some crazy reason you need more storage space then that it also takes 32MB to 16GB SD cards that can be inserted at the bottom of the camera and also have a rubber cover to keep them from getting ruined. You can even enlarge photos to a 2.0 Mega-Pixels. This camera has so many features that I can’t even tell you about them all in this one post. I’m actually still learning them all as the KidiZoom Plus, has so many incredible options. It comes with both a USB plug and an A/V cord so you can plug it into the TV to show off all your fun photos or play one of the fun built in games. Gavin really likes the ‘Chicken Pix’ Game and Johnny had fun playing the ‘Fast Match’ game. You can select how to use the camera with a simple turn of a dial found at the top center of the back of the camera. 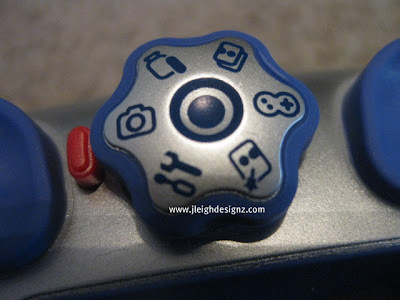 It has the same icons used on my own camera making this an easy way for older kids to transition up to a regular camera when the time comes. 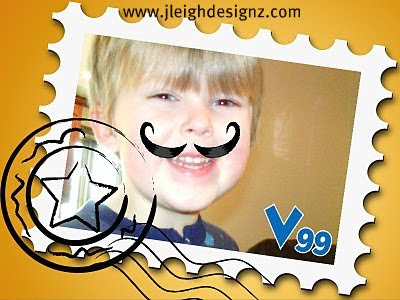 I wanted to show you some of the fun photos Gavin and I have put together using the Vtech KidiZoom Plus Digital Camera! Both of these photos feature the fun frames and stamps features. The KidiZoom Plus comes with multiple choices right on the camera. It also comes with a CD ROM photo editor that you can install onto your computer giving you even more fun choices. 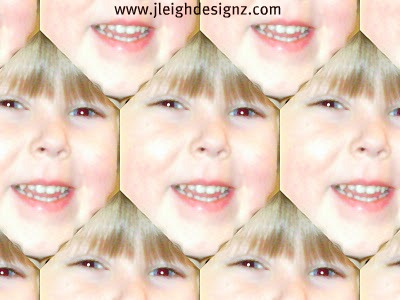 You can also play with your photos and turn them into fun designs like this! 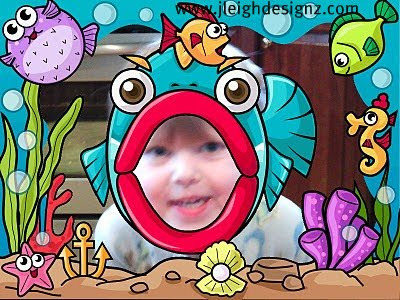 Vtech has offered one J. Leigh Designz a Kidizoom Plus in your choice of Blue or Pink! 4.) Blog about my giveaway- with a link back to here AND Vtech 2 entries(get one more if you include a photo of the giveaway). 8.) Become a Fan of Vtech on Facebook – State your a reader! That’s many chances to win a Kidizoom Plus from Vtech! Contest ends April 12th at 11:59pm!